On a festive but spooky edition of After Hours AM/America’s Most Haunted Radio — Thursdays 9-11pE with hosts Joel Sturgis and Eric Olsen — we talk Nevada ghost town Gold Point’s annual Memorial Day Weekend paranormal extravaganza with Josh Cushman and Justin Cimock of Dinner With a Ghost. We talk with John and Justin at 10pE; at 9pE Joel and Eric review the week’s most beguiling paranormal news and banter amusingly. 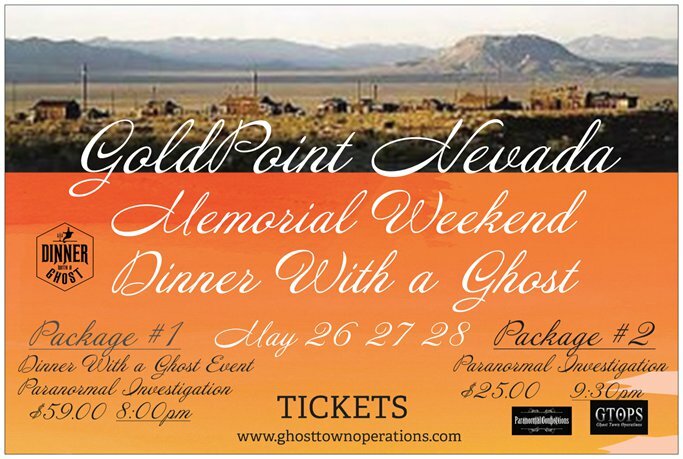 Dinner with a Ghost is a movable feast that always circles back to the historic ghost town of Gold Point, Nevada, for a ripping Memorial Day Weekend of food, ghosts, live music, camping, salooning, wide open vistas, and a dazzling night sky. 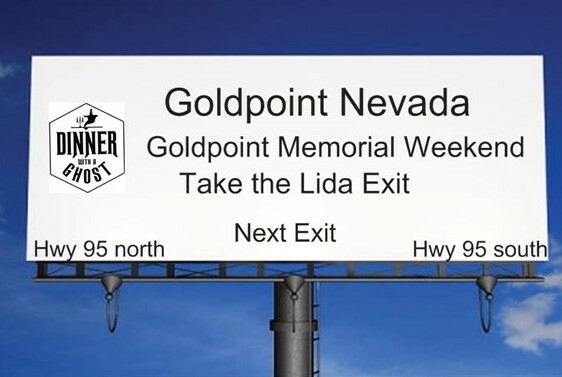 Gold Point is, shall we say, isolated, baking cheerfully in the desert about 180 miles northwest of Las Vegas, not far from the California border. 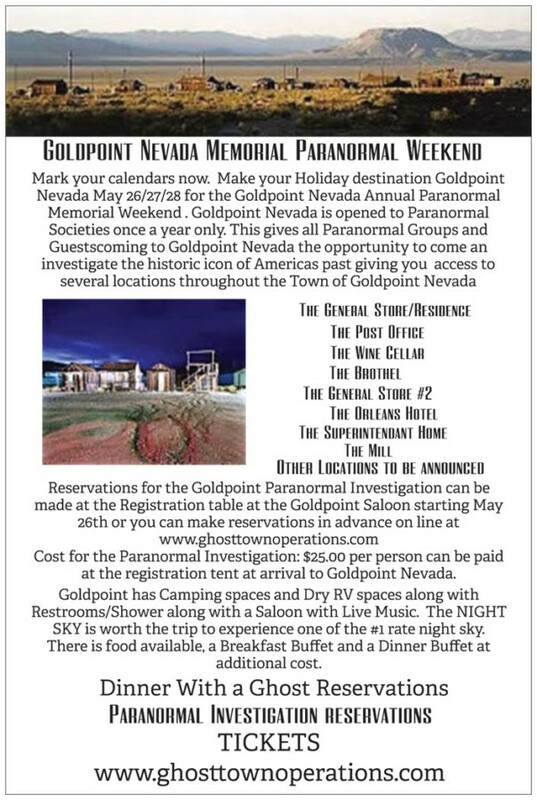 In addition to the Gold Point weekend, additional DWAG events include the Redd Foxx home in Las Vegas, June 2,3; the Pioneer Saloon in Goodsprings, Nevada, June 9, 10. Dinner With a Ghost alchemically blends history, fine dining, and paranormal investigation into a night of anticipation and wonderment unlike any other. The Dinner With a Ghost experience is uniquely satisfying because it fully engages the body, mind, and spirit through a multi-course gourmet meal, riveting presentation on the history and key personalities of the host location, and warm engagement with any spirits on hand. In fact, Dinner With a Ghost is so solicitous of spirit sensibilities that a place of honor is always set for them at the head of the dining table. At the turn of the century new deposits of silver ore were discovered throughout the area, bringing a surge of 40,000 people, with some of them drifting back to the old mining operation at Lime Point. In 1905 high grade silver ore was discovered and the Great Western Mine began operations about a half-mile from Lime Point, bringing in a rush of hopefuls to the new town of Hornsilver. 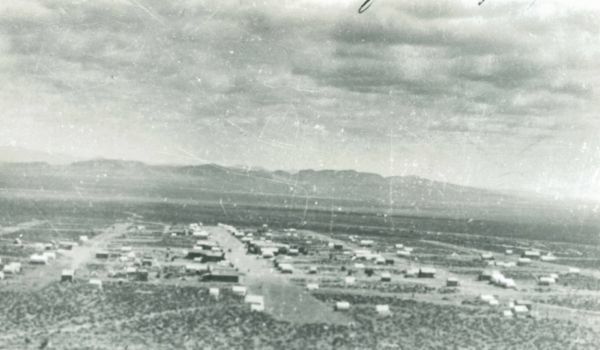 At its peak in 1908, Hornsilver boasted a population of 1,000, with over 225 wood-framed buildings, tents, and shacks around town, including 13 saloons. With all kinds of turmoil and litigation over claim jumping, operations waxed and waned until 1927 when gold was discovered in the Great Western Mine, which led to a town name change to Gold Point because the only thing better than silver is gold. After ten years of development and perfection of the model through hard-won experience at events throughout the Southwest, we are ready to take Dinner With a Ghost on the road and deep into the heart of American history with the Presidents and Kings Tour. We will present the DWAG experience at historic landmarks and homes associated with American presidents including Abraham Lincoln, Thomas Jefferson, Andrew Jackson, James Madison, James Monroe, Harry Truman, Woodrow Wilson, William Henry Harrison, James Buchanan, Millard Fillmore, in addition to Confederate States of America president Jefferson Davis and Republic of Texas president Sam Houston. On the “kingly” side of the ledger we have Elvis Presley, Martin Luther King, Michael Jackson, B.B. King, Davy Crockett, and many others in the offing. The Presidents and Kings Tour is planned to begin in March, 2018, and work its way across the southern tier of the nation through the spring before circling up the East Coast and back across the northern tier. We will carefully tailor the historical presentation, atmosphere, and even period costuming to make each event on the tour visually and historically compelling, as well as amenable to spirit interaction. The tour will be recorded for TV presentation, either in episodic or documentary film form, and will appeal to viewers from a visual, historical, travel, storytelling, and paranormal investigation standpoint. The tour will be marketed nationally via paranormal media, social media, and sponsorship/partnership; and in each market via local media, world of mouth, grass roots networking, and cooperation with the venue. In 1977 John walked from NYC to San Diego, CA as part of “The Walk for Humanity” to ignite excitement and inspire kids with Muscular Dystrophy. After John’s momentous journey across the country, he continued to work with foundations, charities, and educational organizations to assist the next generation in becoming future leaders. John is repeating his historic journey 40 years alter beginning Labor Day, 2017. John has also dedicated a part of his life to history, becoming an expert on the Civil War era, as well as one of the Western region’s biggest collectors of Civil War memorabilia. John has also authored a book series called History Through the Eyes of a Child. 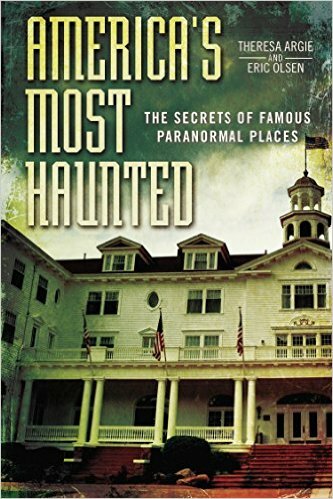 The preservation of history became the impetus for John in creating Ghost Town Operations, aka GTOPS, a team of paranormal experts with proven track records in ghost hunting, film and video production, as well fine dining. The GTOPS team has traveled thousands of miles to date to film ghostly encounters, host events, and to help national historic towns preserve their individual unique stories for the benefit of all. John’s vision is to bring Dinner With a Ghost to some of our nations most famous and historical landmarks and pay homage to their ghostly inhabitants. Justin grew up in Las Vegas, Nevada where he and his friends conducted numerous ghost hunts leading to several bone-chilling encounters with the paranormal. In 2002 Justin joined the U.S. Navy where he spent four tours of duty in Iraq, and after five years was honorably discharged. In addition to being part of the GTOPS team, Justin has his own podcast and writes films. He is always seeking out paranormal activity and enjoys communicating with spirits from the other side.